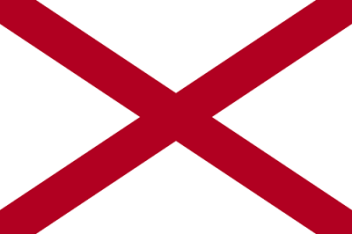 The State Flag of Alabama is a rectangular shape and features a red St. Andrew cross on a white background. The flag serves as a symbol of honor, heritage and regional pride and is displayed at state buildings. 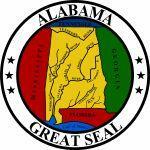 The Alabama State Flag is flown on national and state holidays and on any other days proclaimed by the governor. There is an Order of Precedence for flags. State Flags are displayed in order as they entered the Union. Car Flags are often displayed to represent of an individual's allegiance to their state. Alabama State car flags are used by their owners as mobile emblems of their home. Car flags are usually made from strong materials and are attached to a car via a pole and clip window attachment. What is the design of the Alabama state flag? The red diagonal cross is based on the Confederate war flag. What is the official description as detailed in the Alabama legislature? The ratio was originally 1:1 meaning it is 1 unit tall for every 1 unit wide - a square shape. The debate as to whether the design should be square of rectangular was referred to on June 29 1987 when Attorney General Don Siegelman suggested that "the modern state flag of Alabama should be rectangular in shape". Who designed the Alabama State Flag? What is the history of the Alabama State Flag? The St. Andrew's cross is also the symbol for the national flag of Scotland. The Alabama flag is kept and used as required by the code specified in the constitution of the state.